In our day to day life, we avail many services from different kinds of people. These services have the risk of going haywire if not channelized in a proper manner. Contracts Forms helps to channelize the rights of the customer over the services availed. They also help to limit the liability of the service provided towards the customer. Service Forms are available for people to record pertinent details about the services availed in a disciplined manner. 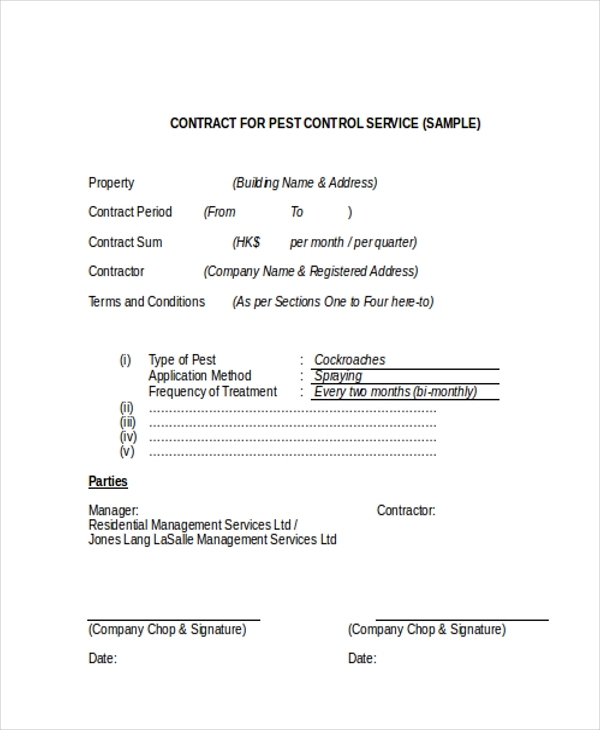 Pest Control Service Agreement Contract is a format that captures the agreement between the customer who seeks pest control office and the pest control organization that helps them to control the pest. Contract Consulting Services is a format that captures the terms and conditions of a contract which can be for any type of services. It is a simple format that can be customized. You may also see Purchase Contract Forms. 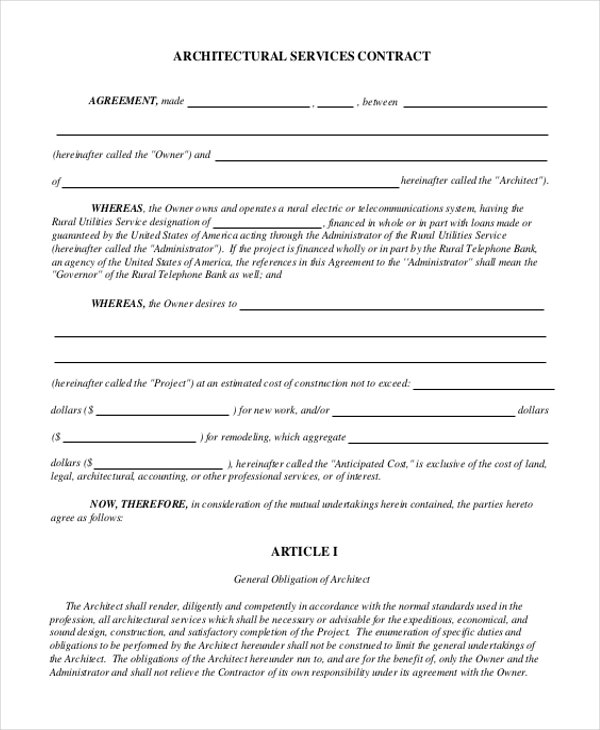 Sample Professional Services Contract is a contract services sample format that captures all ingredients about the agreement entered into the professional services offering organization and the customer who seek the same. 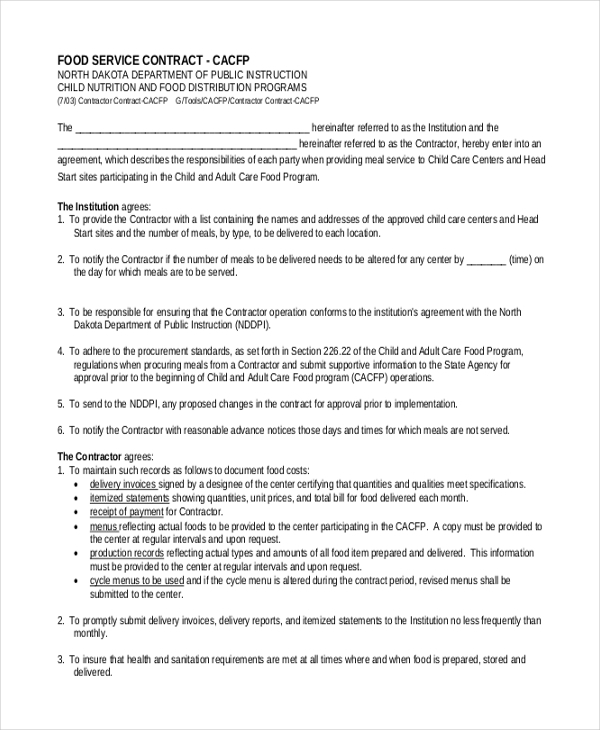 Food Service Contract Example is a contract sample that captures all the terms and conditions related to Food Services. It is a simple format that can be customized by the organizations. You may also see Car Sale Contract Forms. 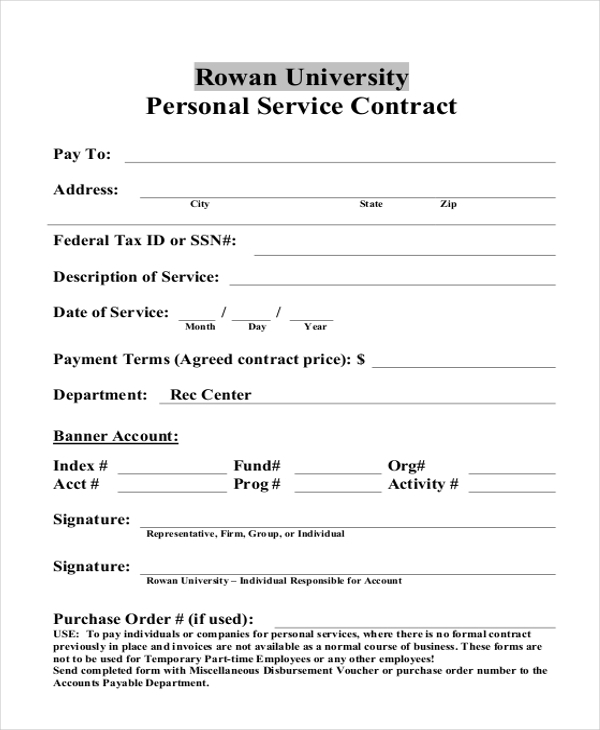 Personal Service Contract is a contract format that captures the contractual terms that can be used in for personal services provided and received. It is a simple format that can be customized. Architectural Services Contract is a contract format that is entered between the builders and the Architects. It is a neatly designed format that can be used by anyone by customizing the same. You can also see Marriage Contract Forms. Vehicle Service Contract is a simple contract format that captures the terms and conditions pertaining to Vehicle Service. It is struck between the vehicle owner and the service center. 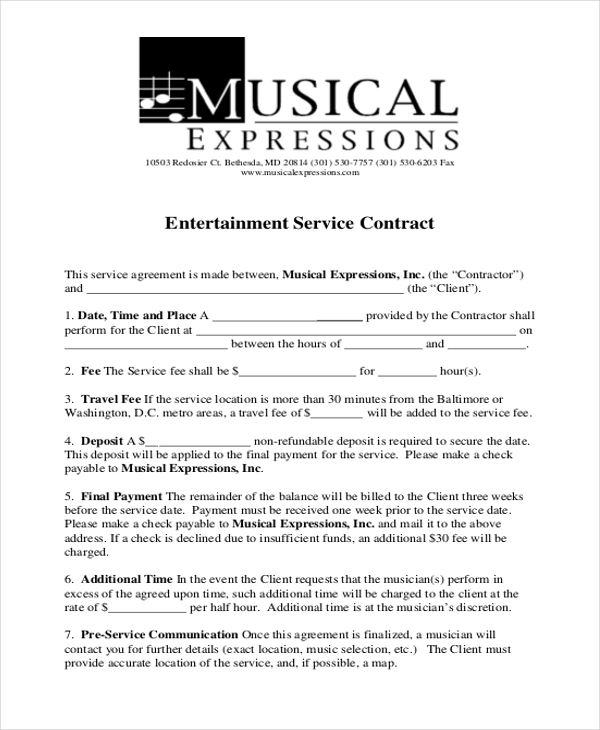 Entertainment Service Contract is a format that captures the rules and regulations pertaining to Entertainment. It is entered between the Entertainment Company and the requesting organization or individual. 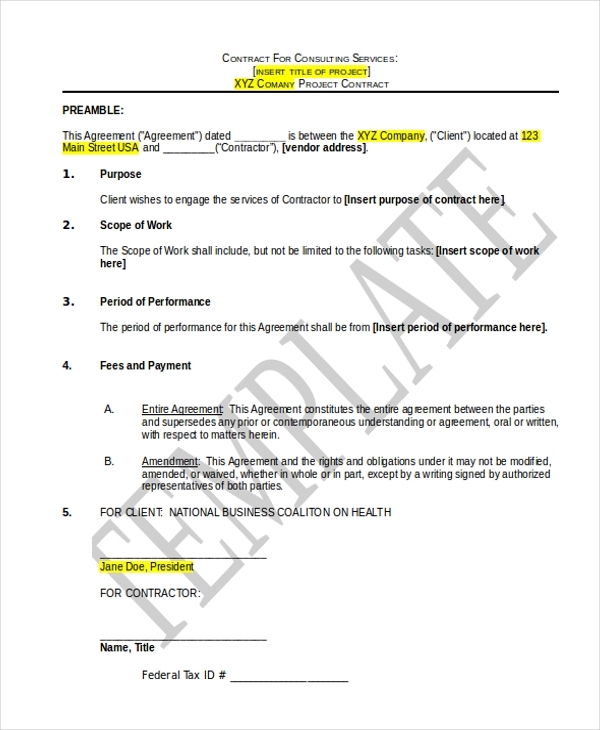 Service Contract Transmittal Form is a contract format that captures the terms and conditions that are applicable in a Service Contract. Service Contracts differ from one service to another. 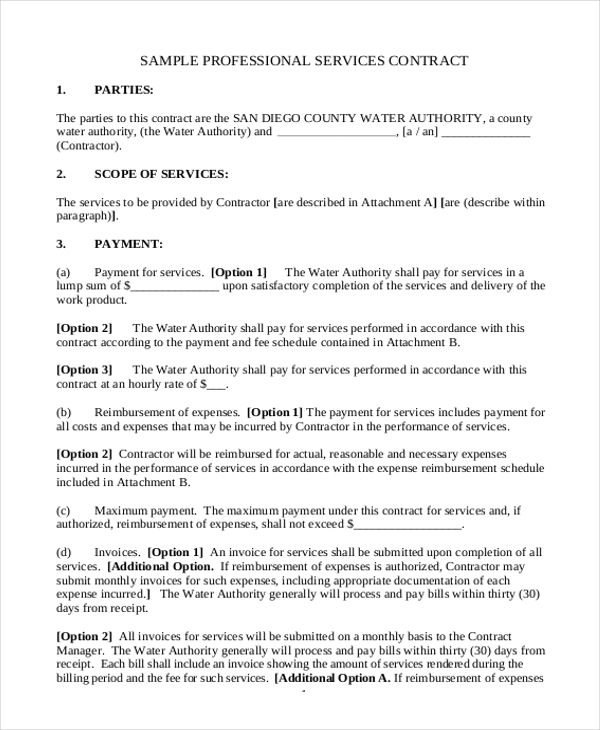 How to Use Service Contract? Service Contracts can be used for multiple types of services provided for various purposes. Service Contracts safeguard people from being taken for granted by service providers. In the same wave length, it safeguards the interest of the Service Providers by limiting their liability towards the customers. Service Contracts are highly useful for all the parties involved in business dealings. They provide an opportunity to enter into terms and clauses that bind both the parties in the dealing. They help all concerned to understand each one’s liability towards others. You may also see Nanny Contract Forms. Who Benefits From Service Contracts? Every person who wants to avail any type of service gets benefitted by Service Contracts. Every organization or individual who provides different types of services to others also benefits out of Service Contracts. All service providers who do not want to acquire losses but provide service to customers in a straightforward manner gets protected by the clauses in Service Contracts. Service Contracts also benefits the customers who avail various types of services offered by Service Providers in a safe manner. Service Contracts safeguard the customers’ interest by providing protective clauses. You can also see Land Contract Forms. Service Contract formats are available from many types of services rendered to customers. 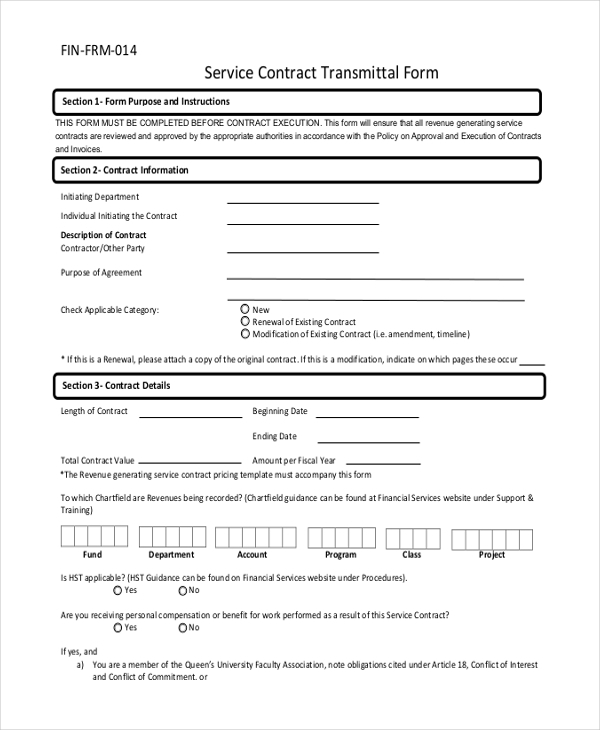 Download Service Contract formats which are available for free download. These are very useful documents for customers as well as the individuals or organizations offering different kinds of service to the customer. Service Contracts can be customized by people who require the same in an easy manner.